Next: What Is a Tax ID? Your conflict of interest policy protects the corporation’s interest when it is contemplating entering into a transaction or arrangement that might benefit the private interest of a director, officer, or other key personnel or might result in a possible excess benefit transaction. This policy supplements, but does not replace, applicable state and federal laws governing conflict of interest and nonprofit corporations. Free Conflict of Interest Policy Template! 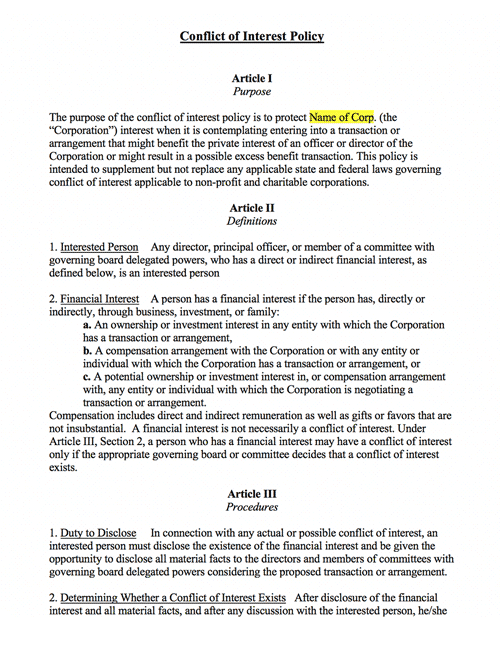 This conflict of interest policy template was drafted by an attorney. This document is intended to be used as a sample or model only. Some of the information provided in this template may or may not fit the needs of a specific organization. Use of this template should not be construed as legal counsel or substitute the advice of an attorney. A key responsibility of the board of directors is to provide oversight. Undisclosed conflicts of interest can compromise public trust in the nonprofit. A strong conflict of interest policy that is regularly reviewed and conflict of interest statements that are signed annually by directors and key personnel help to ensure that the organization and its leadership are protected. A disclosure statement that is completed and signed by directors and key personnel each year. The process for reviewing potential conflicts. The process for handling a conflict when it arises. The consequences for violating the policy. You may use our free conflict of interest policy template as a starting point for your nonprofit’s policy. As with your bylaws, when you pursue federal tax exemption, the IRS will ask you to either attest to the fact that you have adopted a conflict of interest policy or request that you attach a copy to your application. Your conflict of interest policy governs situations when there may be a conflict between the interests of the nonprofit and the interests of those who might privately benefit from its actions. Your board of directors and key personnel should sign an annual disclosure statement of all known conflicts. Undisclosed conflicts of interest can compromise public trust. This page was last fact-checked March 18, 2014.